For the American lawyer and diplomat, see Stuart Nash Scott. 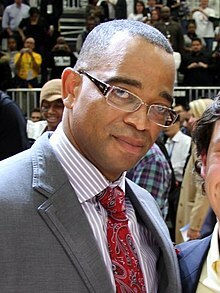 Raleigh Memorial Park, Raleigh, North Carolina, U.S.
Stuart Orlando Scott (July 19, 1965 – January 4, 2015) was an American sportscaster and anchor on ESPN, most notably on SportsCenter. Well known for his hip-hop style and use of catchphrases, Scott was also a regular for the network in its National Basketball Association (NBA) and National Football League (NFL) coverage. Scott grew up in North Carolina, and graduated from the University of North Carolina at Chapel Hill. He began his career with various local television stations before joining ESPN in 1993. Although there were already accomplished African-American sportscasters, his blending of hip hop with sportscasting was unique for television. By 2008, he was a staple in ESPN's programming, and also began on ABC as lead host for their coverage of the NBA. In 2007, Scott had an appendectomy and learned that his appendix was cancerous. After going into remission, he was again diagnosed with cancer in 2011 and 2013. Scott was honored at the ESPY Awards in 2014 with the Jimmy V Award for his fight against cancer, less than six months before his death in 2015 at the age of 49. Stuart Orlando Scott was born in Chicago, Illinois on July 19, 1965 as the son of O. Ray and Jacqueline Scott. When he was 7, Scott and his family moved to Winston-Salem, North Carolina. Scott had a brother named Stephen and two sisters named Susan and Synthia. He attended Mount Tabor High School for 9th and 10th grade and then completed his last two years at Richard J. Reynolds High School in Winston-Salem, graduating in 1983. In high school, he was a captain of his football team, ran track, served as Vice President of the Student Council, and was the Sergeant at Arms of the school's Key Club. Scott was inducted into the Richard J. Reynolds High School Hall of Fame during a ceremony on February 6, 2015, which took place during the Reynolds/Mt. Tabor (the two high schools that Scott attended) basketball game. He attended the University of North Carolina at Chapel Hill, where he was a member of Alpha Phi Alpha fraternity and was part of the on-air talent at WXYC. While at UNC, Scott also played wide receiver and defensive back on the football team. In 1987, Scott graduated from the UNC with a B.A. in speech communication. In 2001, Scott gave the commencement address at UNC. Following graduation, Scott worked as a news reporter and weekend sports anchor at WPDE-TV in Florence, South Carolina from 1987 until 1988. Scott came up with the phrase "as cool as the other side of the pillow" while working his first job at WPDE. After this, Scott worked as a news reporter at WRAL-TV 5 in Raleigh, North Carolina from 1988 until 1990. WRAL Sports anchor Jeff Gravley recalled there was a "natural bond" between Scott and the sports department. Gravley described his style as creative, gregarious and adding so much energy to the newsroom. Even after leaving, Scott still visited his former colleagues at WRAL and treated them like family. From 1990 until 1993, Scott worked at WESH, an NBC affiliate in Orlando, Florida as a sports reporter and sports anchor. While at WESH, he met ESPN producer Gus Ramsey, who was beginning his own career. Ramsey said of Scott: "You knew the second he walked in the door that it was a pit stop, and that he was gonna be this big star somewhere someday. He went out and did a piece on the rodeo, and he nailed it just like he would nail the NBA Finals for ESPN." He earned first place honors from the Central Florida Press Club for a feature on rodeo. Al Jaffe, ESPN's vice president for talent, brought Scott to ESPN2 because they were looking for sportscasters who might appeal to a younger audience. Scott became one of the few African-American personalities who was not a former professional athlete. His first ESPN assignments were for SportsSmash, a short sportscast twice an hour on ESPN2's SportsNight program. After Keith Olbermann left SportsNight for ESPN's SportsCenter, Scott took his place in the anchor chair at SportsNight. After this, Scott was a regular on SportsCenter. At SportsCenter, Scott was frequently teamed with fellow anchors Steve Levy, Kenny Mayne, Dan Patrick, and most notably, Rich Eisen. Scott was a regular in the This is SportsCenter commercials. In 2002, Scott was named studio host for the NBA on ESPN. He became lead host in 2008, when he also began at ABC in the same capacity for its NBA coverage, which included the NBA Finals. Additionally, Scott anchored SportsCenter's prime-time coverage from the site of NBA post-season games. From 1997 until 2014, he covered the league's finals. During the 1997 and 1998 NBA Finals, Scott did one-on-one interviews with Michael Jordan. When Monday Night Football moved to ESPN in 2006, Scott hosted on-site coverage, including Monday Night Countdown and post-game SportsCenter coverage. Scott previously appeared on NFL Primetime during the 1997 season, Monday Night Countdown from 2002 to 2005, and Sunday NFL Countdown from 1999 to 2001. Scott also covered the MLB playoffs and NCAA Final Four in 1995 for ESPN. Scott appeared in each issue of ESPN the Magazine, with his Holla column. During his work at ESPN, he also interviewed Tiger Woods, Sammy Sosa, President Bill Clinton and President Barack Obama during the 2008 presidential campaign. As a part of the interview with President Barack Obama, Scott played in a one-on-one basketball game with the President. In 2004, per the request of U.S. troops, Scott and fellow SportsCenter co-anchors hosted a week of programs originating from Kuwait for ESPN's SportsCenter: Salute the Troops. He hosted a number of ESPN game and reality shows, including Stump the Schwab, Teammates, and Dream Job, and hosted David Blaine's Drowned Alive special. He hosted a special and only broadcast episode of America's Funniest Home Videos called AFV: The Sports Edition. While there were already successful African-American sportscasters, Scott blended hip-hop culture and sports in a way that had never been seen before on television. He talked in the same manner as fans would at home. ESPN director of news Vince Doria told ABC: "But Stuart spoke a much different language ... that appealed to a young demographic, particularly a young African-American demographic." Michael Wilbon wrote that Scott allowed his personality to infuse the coverage and his emotion to pour out. Scott also integrated pop culture references into his reports. One commentator remembered his style: "he could go from evoking a Baptist preacher riffing during Sunday morning service ('Can I get a witness from the congregation?! '), to quoting Public Enemy frontman Chuck D ('Hear the drummer get WICKED!') In 1999, he was parodied on Saturday Night Live by Tim Meadows. Scott appeared in music videos with the rappers LL Cool J and Luke, and he was cited in "3 Peat", a Lil Wayne song that included the line: "Yeah, I got game like Stuart Scott, fresh out the ESPN shop." In a 2002 segment of NPR's On the Media, Scott revealed one approach to his anchoring duties: "Writing is better if it's kept simple. Every sentence doesn't need to have perfect noun/verb agreement. I've said 'ain't' on the air. Because I sometimes use 'ain't' when I'm talking." As a result of his unique style, Scott and ESPN received a lot of hate mail from people who resented his color, his hip-hop style, or his generation. In a 2003 USA Today survey, Scott finished first in the question of which anchor should be voted off SportsCenter, but he also was second to Dan Patrick in the 'definitely keep him' voting. Jason Whitlock criticized Scott's use of Jay-Z's alternate nickname, "Jigga", at halftime of Monday Night Football as ridiculous and offensive. Scott never changed his style and ESPN stuck with him. "Holla at a playa when you see him in the street!" "Just call him butter 'cause he's on a roll"
"They Call Him the Windex Man 'Cause He's Always Cleaning the Glass"
"You Ain't Gotta Go Home, But You Gotta Get The Heck Outta Here." "He Treats Him Like a Dog. Sit. Stay." "And the Lord said you got to rise Up!" "Make All the Kinfolk Proud ... Pookie, Ray Ray and Moesha"
"It's Your World, Kid ... The Rest of Us Are Still Paying Rent"
"Can I Get a Witness From the Congregation?" "Doing It, Doing It, Doing It Well"
"See ... What Had Happened Was"
ESPN president John Skipper said Scott's flair and style, which he used to talk about the athletes he was covering, "changed everything." Fellow ESPN Anchor, Stan Verrett, said he was a trailblazer: "not only because he was black – obviously black – but because of his style, his demeanor, his presentation. He did not shy away from the fact that he was a black man, and that allowed the rest of us who came along to just be ourselves." He became a role model for African-American sports journalists. Scott was married to Kimberly Scott from 1993 to 2007. They had two daughters together, Taelor and Sydni. Scott lived in Avon, Connecticut. At the time of his death, Scott was in a relationship with Kristin Spodobalski. During his Jimmy V Award speech, he told his teenage daughters: "Taelor and Sydni, I love you guys more than I will ever be able to express. You two are my heartbeat. I am standing on this stage here tonight because of you." Scott was injured when he was hit in the face by a football during a New York Jets mini-camp on April 3, 2002, while filming a special for ESPN, a blow that damaged his cornea. He received surgery but afterwards suffered from ptosis, or drooping of the eyelid. After leaving Connecticut on a Sunday morning in 2007 for Monday Night Football in Pittsburgh, Scott had a stomachache. After the stomachache worsened, he went to the hospital instead of the game and later had his appendix removed. After testing the appendix, doctors learned that he had cancer. Two days later, he had surgery in New York that removed part of his colon and some of his lymph nodes near the appendix. After the surgery, they recommended preventive chemotherapy. By December, Scott—while undergoing chemotherapy—hosted Friday night ESPN NBA coverage and led the coverage of ABC's NBA Christmas Day studio show. Scott worked out while undergoing chemotherapy. Scott said of his experience with cancer at the time: "One of the coolest things about having cancer, and I know that sounds like an oxymoron, is meeting other people who've had to fight it. You have a bond. It's like a fraternity or sorority." When Scott returned to work and people knew of his cancer diagnosis, the well-wishers felt overbearing for him as he just wanted to talk about sports, not cancer. The cancer returned in 2011, but it eventually went back into remission. He was again diagnosed with cancer on January 14, 2013. After chemo, Scott would do mixed martial arts and/or a P90X workout regimen. By 2014, he had undergone 58 infusions of chemotherapy and switched to chemotherapy pills. Scott also went under radiation and multiple surgeries as a part of his cancer treatment. Scott never wanted to know what stage of cancer he was in. On July 16, 2014, Scott was honored at the ESPY Awards, with the Jimmy V Award for his ongoing battle against cancer. He shared that he had 4 surgeries in 7 days in the week prior to his appearance, when he was suffering from liver complications and kidney failure. Scott told the audience, "When you die, it does not mean that you lose to cancer. You beat cancer by how you live, why you live, and in the manner in which you live." At the ESPYs, a video was also shown that included scenes of Scott from a clinic room at Johns Hopkins Hospital and other scenes from Scott's life fighting cancer. Scott ended the speech by calling his daughter up to the stage for a hug, "because I need one," and telling the audience to "have a great rest of your night, have a great rest of your life." On the morning of January 4, 2015, Scott died of appendix cancer in his home in Avon, Connecticut, at the age of 49. 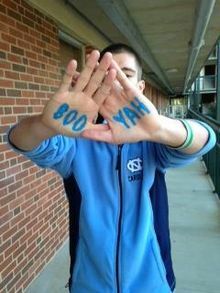 A UNC student featured on ESPN's broadcast of the Notre Dame-UNC basketball game on January 5, 2015, honoring Scott with his trademark "Boo Yah" saying. I will miss Stuart Scott. Twenty years ago, Stuart helped usher in a new way to talk about our favorite teams and the day's best plays. For much of those twenty years, public service and campaigns have kept me from my family – but wherever I went, I could flip on the TV and Stu and his colleagues on SportsCenter were there. Over the years, he entertained us, and in the end, he inspired us – with courage and love. Michelle and I offer our thoughts and prayers to his family, friends, and colleagues. A number of National Basketball Association athletes—current and former—paid tribute to Scott, including Stephen Curry, Carmelo Anthony, Kobe Bryant, Steve Nash, Jason Collins, Shaquille O'Neal, Magic Johnson, Dwyane Wade, LeBron James, Michael Jordan, Bruce Bowen, Dennis Rodman, James Worthy and others. A number of golfers paid tribute to Scott: Tiger Woods, Gary Player, David Duval, Lee Westwood, Blair O'Neal, Jane Park and others. Other athletes paid tribute including Robert Griffin III, Russell Wilson, Jon Lester, Lance Armstrong, Barry Sanders, J. J. Watt, David Ortiz and Sheryl Swoopes. UNC basketball coach Roy Williams called him a "hero." Arizona Cardinals head coach Bruce Arians said: "We lost a football game but we lost more this morning. I think one of the best members of the media I've ever dealt with, Stuart Scott, passed away." Colleagues Hannah Storm and Rich Eisen gave on-air remembrances of Scott. On SportsCenter, Scott Van Pelt and Steve Levy said farewell to Scott and left a chair empty in his honor. Tom Jackson, Cris Carter, Chris Berman, Mike Ditka and Keyshawn Johnson from NFL Countdown shared their memories of Scott. During Ernie Johnson, Jr.'s acceptance speech for his 2015 Sports Emmy Award for Best Studio Host, he gave his award to Scott's daughters, saying it "belongs with Stuart Scott". At the 67th Primetime Emmy Awards and at the 2015 ESPY Awards, Scott was included in the "in memoriam" segment, a rare honor for a sports broadcaster. Scott, Stuart; Platt, Larry (2015). Every Day I Fight. Blue Rider Press. ISBN 978-0-399-17406-3. ^ a b Strauss, Chris (January 4, 2015). "ESPN's Stuart Scott dies after lengthy battle with cancer". USA Today. Archived from the original on January 5, 2015. ^ a b c d e f g Bensinger, Graham (September 15, 2008). "ESPN's Stuart Scott Speaks Out About Being Diagnosed with Cancer". huffingtonpost.com. Retrieved January 5, 2015. ^ University of North Carolina. "Stuart Orlando Scott '87". alumni.unc.edu. Retrieved January 4, 2015. ^ a b c d e f g h "Stuart Scott Accepts Jimmy V Award". ESPN.com. Retrieved January 4, 2015. ^ a b c Sandomir, Richard. "Stuart Scott, ESPN's Voice of Exuberance, Dies at 49". nytimes.com. Accessed January 6, 2015. ^ a b c "Reynolds High School Classmates Remember Stuart Scott". wfmynews2.com. Archived from the original on January 8, 2015. Retrieved January 8, 2015. ^ "ESPN anchor urges graduates to celebrate diversity, recognize power of communication". unc.edu. Retrieved January 4, 2015. ^ "ESPN anchor and former WPDE employee Stuart Scott dies at 49". carolinalive.com. Retrieved January 4, 2015. ^ Wire Reports. "ESPN's Stuart Scott, who started his career in Florence, dies at 49". scnow.com. Retrieved January 4, 2015. ^ Rabouin, Dion. "Longtime ESPN Anchor Stuart Scott Dies At Age 49". ibtimes.com. Retrieved January 4, 2015. ^ a b c d "ESPN anchor Stuart Scott dies after long battle with cancer". wralsportsfan.com. Retrieved January 4, 2015. ^ a b c d e f g h i j k l m Wulf, Steve. "Stuart Scott dies at age of 49". espn.go.com. Retrieved January 4, 2015. ^ a b c d e f g h i "Stuart Scott Biography". Archived from the original on November 27, 2013. ^ Schwab, Frank (January 4, 2015). "ESPN's Stuart Scott dies at age 49 after long battle against cancer". Yahoo Sports. Retrieved January 4, 2015. ^ a b c d Schiavenza, Matt (January 4, 2015). "Stuart Scott Brought Sports Broadcasting Back to Earth". The Atlantic. Archived from the original on January 5, 2015. ^ Augustine, Bernie (January 4, 2015). "Stuart Scott dead at 49: Rich Eisen, Hannah Storm and Robin Roberts offer emotional farewells to friend". nydailynews.com. New York. Retrieved January 5, 2015. ^ Sanchez, Mark (January 4, 2015). "The 10 best Stuart Scott 'SportsCenter' commercials". nypost.com. Retrieved January 5, 2015. ^ Knoblauch, Austin (January 4, 2015). "ESPN's Stuart Scott dies after lengthy battle with cancer". latimes.com. Retrieved January 8, 2015. ^ a b Wiedmer, Mark (January 5, 2015). "Wiedmer: ESPN's Scott would have loved Dallas win". Chattanooga Times Free Press. Archived from the original on January 5, 2015. ^ Giglo, Joe (January 4, 2015). "Sports world mourns the loss of longtime ESPN sportscaster Stuart Scott". News & Observer. Archived from the original on January 5, 2015. ^ Waldron, Travis. "Boo-Ya: How Stuart Scott Taught ESPN That Black Culture Matters". Thinkprogress.org. Retrieved January 5, 2015. ^ Wilbon, Michael. "Stuart Scott changed the game". espn.go.com. Accessed January 6, 2015. ^ a b c Sandomir, Richard (January 4, 2015). "ESPN's Stuart Scott Dies at 49". The New York Times. Archived from the original on January 5, 2015. ^ Boren, Cindy (January 4, 2015). "ESPN's Stuart Scott dies of cancer at 49 (updated)". The Washington Post. Archived from the original on January 5, 2015. ^ a b Williams, Stereo. "Remembering ESPN's Sly, Cocky, and Cool Anchor Stuart Scott". thedailybeast.com. The Daily Beast. Retrieved January 5, 2015. ^ Sandomir, Richard (January 9, 2011). "Onion Hopes Parody of 'SportsCenter' Leaves Viewers Saying Boo-Yah". New York Times. Retrieved January 4, 2015. ^ "Boo-yah or just boo? Scott has fans and detractors". usatoday.com. December 3, 2003. Retrieved January 5, 2015. ^ "Boo-yah or just boo? Scott has fans and detractors". USA Today. December 3, 2003. Retrieved May 24, 2010. ^ Transcript. "Is Stuart Scott Frontin?". onthemedia.org. Archived from the original on January 5, 2015. Retrieved January 4, 2015. ^ a b c Rothkranz, Lindzy. "They Call Him the Windex Man 'Cause He's Always Cleaning the Glass". heavy.com. Retrieved January 4, 2015. ^ Chawkins, Steve (January 4, 2015). "Stuart Scott dies at 49; ESPN sportscaster with catchphrases". Los Angeles Times. Retrieved January 5, 2015. ^ a b c d e "10 Unforgettable Stuart Scott Catchphrases". BET.com. Retrieved July 24, 2015. ^ Johnson, Brad (January 5, 2015). "ESPN's Stuart Scott was a game-changer for me and others". Boston Herald. Archived from the original on January 5, 2015. ^ "Kimberly Scott, Stuart Scott's Ex-Wife: 5 Facts You Need to Know". Heavy. Retrieved January 4, 2015. ^ "Kimberly Scott v. Stuart Scott". FindLaw. Retrieved January 4, 2015. ^ Kelley, Michael (January 4, 2015). "ESPN Anchor Stuart Scott Has Died At Age 49". Business Insider. Retrieved January 4, 2015. ^ a b AP (January 4, 2015). "Longtime ESPN anchor Stuart Scott dead at 49". New York Post. Retrieved January 5, 2015. ^ "Scott hopes to be back in studio soon". USA Today. May 28, 2002. Retrieved May 24, 2010. ^ Jussim, Matthew (January 15, 2013). "Stuart Scott Announces On Twitter That Cancer Has Returned, ESPN Broadcaster Hosts SportsCenter After News Is Released". Sports World Report. Retrieved January 4, 2015. ^ a b c d Sandomir, Richard (March 11, 2014). "A Story of Perseverance: ESPN Anchor's Private Battle With Cancer Becomes a Public One". The New York Times. Retrieved January 5, 2015. ^ "Scott will host NBA shows while undergoing chemotherapy". ESPN. December 21, 2007. Retrieved January 4, 2015. ^ "Scott will host NBA shows while undergoing chemotherapy". espn.go.com. Retrieved January 5, 2015. ^ a b Scott, Stuart. "Stuart Scott Says, 'F U, Cancer!'". menshealth.com. Retrieved January 5, 2015. ^ Busbee, Jay (January 14, 2013). "ESPN's Stuart Scott announces on Twitter that his cancer has returned". Yahoo! Sports. ^ Foss, Mike. "Hannah Storm breaks Stuart Scott's passing to the world in incredible eulogy". usatoday.com. Retrieved January 4, 2015. ^ Cohn, David. "Cohn: A story about cancer, Stuart Scott's ESPY speech and the power of sports". stanforddaily.com. Retrieved January 5, 2015. ^ a b Jackson, Scoop. "The authentic genius of Stuart Scott". Espn.go.com. Retrieved January 6, 2015. ^ "Stuart Scott dies at age of 49". espn.go.com. Retrieved January 4, 2015. ^ "ESPN SportsCenter Anchor and Dedicated Family Man Stuart Scott has Passed Away". espn.go.com. ESPN. Retrieved January 4, 2015. ^ Dietsch, Richard (January 4, 2015). "Inside ESPN's Tribute to Late SportsCenter Star Stuart Scott". Sports Illustrated. Retrieved January 4, 2015. ^ Boren, Cindy (January 4, 2015). "President Obama: 'I will miss Stuart Scott'". washingtonpost.com. Retrieved January 4, 2015. ^ "NBA world remembers Stuart Scott". espn.go.com. Retrieved January 6, 2015. ^ a b espn.com. "Twitter reaction to Scott's death". espn.go.com. Retrieved January 4, 2015. ^ "Golf world remembers Stuart Scott". espn.go.com. Retrieved January 6, 2015. ^ Weinfuss, Josh. "Bruce Arians honors ESPN's Stuart Scott". espn.go.com. Retrieved January 6, 2015. ^ Burke, Timothy. "Rich Eisen, Hannah Storm, & Others React Live To Stuart Scott's Death". deadspin.com. Retrieved January 4, 2015. ^ "'SportsCenter' Pays Homage To Stuart Scott". espn.go.com. Retrieved January 6, 2015. ^ "'NFL Countdown' Remembers Scott". espn.go.com. Retrieved January 6, 2015. ^ "Ernie Johnson Gives His Sports Emmy to Daughters of the Late Stuart Scott". bleacherreport.com. May 5, 2015. Retrieved July 15, 2016. ^ a b c d e f g h i j k l m n o p q r "Stuart Scott – IMDb". imdb.com. Retrieved January 6, 2015. ^ "Stuart Scott – Fandango". fandango.com. Retrieved January 8, 2015. ^ "Stump the Schwab (2004–2006) – IMDb". IMDb. ^ "Teammates 2005, TV Show". TV Guide. ^ Doody, Ben. "Stuart Scott Dead: 5 Fast Facts You Need to Know". heavy.com. Retrieved January 8, 2015. This page is based on the Wikipedia article Stuart Scott; it is used under the Creative Commons Attribution-ShareAlike 3.0 Unported License (CC-BY-SA). You may redistribute it, verbatim or modified, providing that you comply with the terms of the CC-BY-SA.